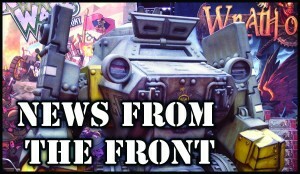 Rivet Wars gives us a look into what they've been up to with a new issue of News From the Front. During the Rivet Wars kickstarter there was a call for a campaign that would involve several scenarios and many of the kickstarter units. Super Robot Punch has created that campaign and it is now ready for download! Also be sure to look at all the other fan created scenarios, cards and other additions that are free to download.